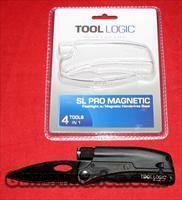 Description: TOOL LOGIC SL PRO MAGNETIC OFFERS A 3" 50/50 SERRATED BLADE AND LOUD EMERGENCY SIGNAL WHISTLE. PLUS A BRILLIANT WHITE LED FLASHLIGHT THAT IS DETACHABLE FROM ITS SLEEVE ATTACHED TO THE TOP OF THE KNIFE HANDLE. THE LED MODULE HAS A PIVOTING MAGNETIC BASE THAT STICKS TO ANY FERROUS METAL SURFACE FOR HANDS FREE USE. THIS IS A SUPER TACTICLE KNIFE!!! THE FLASHLIGHT IS MADE OF TOUGH ANODIZED ALUMINUM AND IS WATERPROOF FOR USE IN WET ENVRIONMENTS OR FOR SHALLOW IMMERSION. THE SL PRO FEATURES SOLID STEEL CONSTRUCTION AND HAS A STAINLESS STEEL POCKET/BELT CLIP ON THE BACK. IT IS AN IDEAL CHOICE FOR RUGGED USE ANYWHERE LIFE TAKES YOU! RETAILS FOR $53.00.